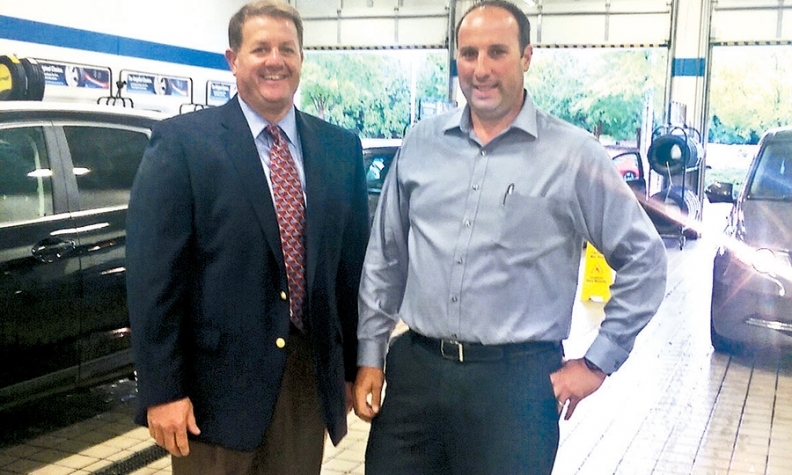 Scott Washle, Crown Honda of Southpoint general manager, left, and Service Director Matt Mann dreamed up Dream Service. A second daily shift works till midnight or later to get repair work done. In Durham, N.C., Honda customers can drop off their vehicles at the local dealership for service as late as 9 p.m. during the week, get a shuttle ride home and pick up their repaired cars by 7 a.m. the next day. With a few exceptions, the repairs are guaranteed by that time, or they're free. It's called Dream Service, and it's the brainchild of two managers at Crown Honda of Southpoint, Scott Washle and Matt Mann. They launched it at the Asbury Automotive Group store a little more than three years ago. A second daily shift of service personnel works until midnight or later -- as late as 4 a.m. if necessary -- to get the work done. The approach is now spreading to other Asbury stores. The night hours are a central piece of a larger service initiative that Asbury is pursuing to win back customers and bolster the most important profit center in its dealerships. In addition to extended service hours, Asbury is going after the Pep Boys of the world with more competitive tire offerings, new quick-service operations, a free windshield wiper program and expanded service marketing. "For decades, the franchise industry has made it easy for other industries to surround themselves around our business model," COO Michael Kearney told Automotive News. "What we're doing is taking back part of that, trying to recapture business we've lost over the years." The effort is gaining traction. And recapturing those sales can do wonders for the bottom line. During the second quarter, same-store parts and service gross profit rose 9 percent. Asbury's service and parts business accounted for 12 percent of second quarter revenue but generated 42 percent of the company's overall gross profit, according to CFO Keith Style. Earlier this year, Asbury launched Dream Service at a Lexus store in Roswell, Ga., and a Toyota store in Greenville, S.C. It's also being added to varying degrees at an unspecified number of stores in Florida. Dream Service is an expansion of extended hours that began at Crown Honda in 2007. That's when the store first stretched its service hours from a 9 p.m. close to 11 p.m. and then midnight to deal with carryover work that was filling up the shop. The store is about 7 miles from three major employers that operate around the clock: Duke University and its hospital; the University of North Carolina at Chapel Hill and its hospital; and Research Triangle Park. In 2011, the guarantee was added, and Mann, the store's service director, came up with the Dream Service moniker. Instead of automatically setting up appointments, service staffers tell customers to "bring it on down" whenever it's convenient for them, Washle said. Customers can drop off vehicles as late as midnight most days. If they get the vehicle there by 9 p.m. Monday through Thursday, the work is guaranteed to be finished by 7 a.m. the next day, or it's free. The store has shorter hours Friday through Sunday. The guarantee covers most jobs with the exception of engine or transmission replacements and rebuilds. Asbury Automotive Group's 82 dealerships are pursuing several initiatives to boost service and parts business. • 3 stores offer overnight repairs; several more are experimenting with it. • 18 stores offer quick service. • Asbury just graduated 1st class of 11 technicians from in-house training facility. • Service and parts accounted for 12% of Q2 revenue but 42% of gross profit. Washle and Mann have had to make a free repair just one time in the three-plus years the guarantee has been running -- for a $228 job. And business has boomed. The 22-lift shop averages 4,500 repair orders a month, nearly triple the volume of 10 years ago. The dealership employs 37 techs, who work on commission; 12 service advisers; and three service managers. It uses seven drivers to shuttle customers to work or home. The dealership markets it as service "while you sleep." Washle says he devotes about 35 percent of his marketing budget to parts and service instead of the 10 percent that's more typical in automotive retail. Said Washle: "I spend my money where the gross is."